I can't believe I had extra fresh roasted pumpkin and nothing to do with it. I was supposed to make someone a pie but that didn't happen. Instead I made pumpkin cupcakes. After the church bake sale I had far too much leftover frosting and nothing for it to go on. Sure frosting is easy to get rid of, it goes on pancakes, graham crackers and it excellent for licking off spoons but it's not exciting. I wanted to have some fun. I whipped up a quick batch of cupcakes and spent some time decorating them with every kind of Fall sprinkle I could find in the pantry. Having a happy after school surprise for the girls was part of the fun. They were very pleased to see a cake plate full of sprinkled cupcakes. Who wouldn't be happy to see a fun colorful plate of yummy looking cupcakes after a long day? Heat oven to 350F, grease sides and bottoms and then lightly flour cupcake pans or use cupcake liners. Sift together flour, baking soda, baking powder, spice, and salt. Set aside. In a large bowl or stand mixer cream the butter and sugar on medium-high until fluffy. Add eggs one at a time and beat well. Add pumpkin and mix until combined. Scrape down sides. Reduce speed to low and add about 1 cup of the flour mixture allowing it to incorporate into the batter. Add the yogurt allowing it to moisten the batter, scrape down sides. Slowly add the the remaining flour. Add orange juice and vanilla, beat on low and then gradually increase speed to high. Beat on medium-high until well blended, scraping sides. Pour a generous ¼ cup of the batter into prepared cupcake pans. The cupcake pans should be filled to the top with batter. Bake 15-20 minutes until firm. Makes 24 cupcakes. 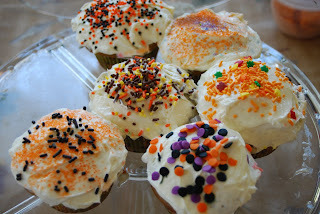 Frost with your favorite cream cheese or vanilla frosting and decorate with lots and lots of sprinkles.